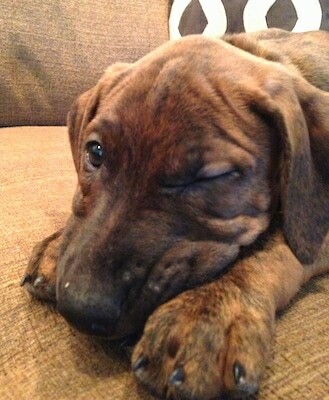 "Eyeore, a brindle Boxer and blue Doberman mix; he is a Boxerman." Boxerman is not a purebred dog. 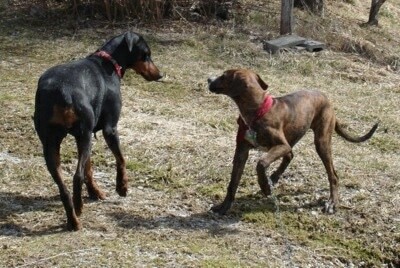 It is a cross between the Boxer and the Doberman Pinscher. The best way to determine the temperament of a mixed breed is to look up all breeds in the cross and know you can get any combination of any of the characteristics found in either breed. Not all of these designer hybrid dogs being bred are 50% purebred to 50% purebred. It is very common for breeders to breed multi-generation crosses. Finn the Boxerman as a puppy at 2 1/2 months old—"Finn came from the Texas Doberman shelter and he was the only one in his litter to have a Doberman face. 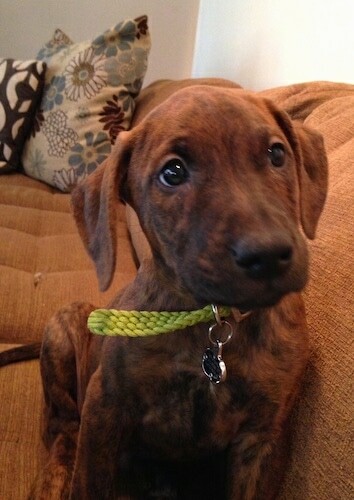 His full name is Griffin Giant Woo-Chester Cash the 3rd. He loves to run around and play, he is especially finicky after his bath. He is a mostly indoor dog, he goes outside to play and to do his business, and is fenced in. He lives with our other dog Fryla, a mixed breed. He's also one of the funniest dogs I've met." 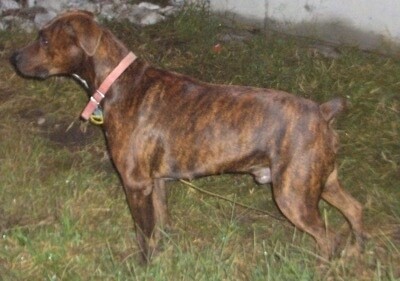 "Diego is a Doberman and Boxer mix. He is a really smart dog, and it didn't take me long to house train him, maybe a month to get him to always go outside. 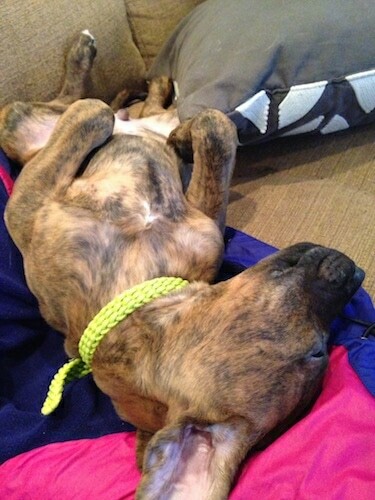 In this picture he is probably two and a half months old. He loves to play and he is great with little children. He was chasing my cousin who is three years old and to catch her he would put his mouth on her, not biting just putting his mouth up against her, like ha I caught you! His bad habits are he likes to get into everything. He chews on underwear and socks. He loves to eat rocks. He definitely loves to chase birds. He is a smart dog though, within a month of me having him, he knows how to roll over, give me a high five and he gives me kisses. But I'm like Diego give me a kiss and he puts his mouth up to mine, not licking me. He knows when I tell him to jump and he dances with me. I can take him outside and he doesn't run away. He listens pretty well for the most part. I tell him to get in the car and he gets in the car, I tell him to get in the back and he goes." 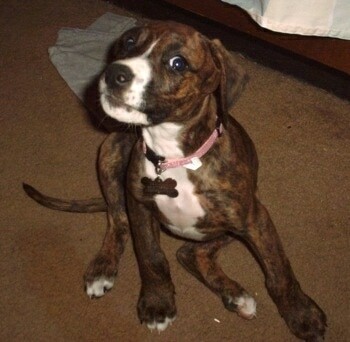 "This is my puppy love Liberty at 8 weeks old. She is a Boxerman Pinscher. 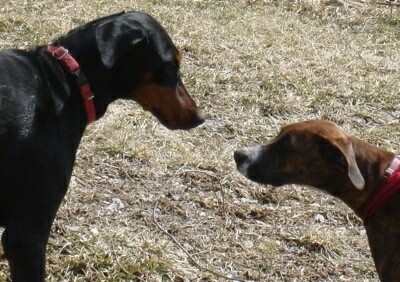 Her mom's name is Justice; she is a full-blooded Doberman Pinscher. 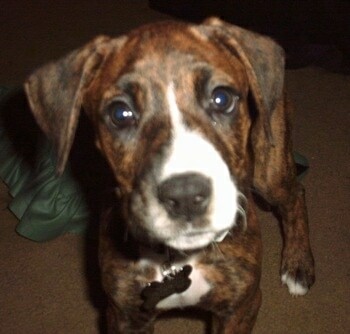 Liberty's dad was a full-blooded Boxer. I call her my lil’ Boxerman Pinscher!"